For today’s post on Celebrating Indie Publishing I am thrilled to share a review of a book that has been much loved since we discovered it earlier in the year. If you’ve followed The Quiet Knitter, you might have seen the review of the first book of the Teacup House series in July 2018 and I am pleased to say that it’s time to share the review of book two. Stevie’s mum is having a party, so she’s baked a delicious cake for all the guests. Stevie’s tiny toy rabbits, Silver and Fig Twitch, would love a taste of its yummy purple icing. How will they get their paws on some? It’s time for an adventure outside the Teacup House! 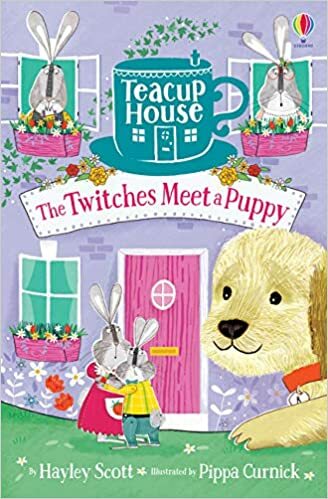 After falling in love with the Twitch family in Meet The Twitches, I quickly ordered a copy of the second book of the series for my mini bookworm so that we could continue with our fun filled adventure with the rabbit family of the Teacup House. Picking up from their adventure in book one of the series, we catch up with Stevie and her mum as they prepare for a party to introduce themselves to their new neighbours. But when the toy rabbits are involved, you just know that there will be fun, laughter and daring missions. witches into a daring mission across the kitchen, weaving between obstacles to get enough icing for a cake of their own. Whilst Fig and Silver are on their adventure, readers find out a little more about Stevie. She’s still not 100% sure about living in the country, life is much different from the city and she misses her friends. Meeting the new neighbours brings much apprehension for Stevie, and it seems that the adults are still making plans about her and for her without asking her what she thinks. As with the previous book, Meet The Twitches, the illustrations are bright and crisp, they bring the story to life and compliment Hayley Scott’s writing perfectly. Being able to see the wonderful cake, the way that Fig and Silver make their way around the obstacles in the kitchen make this a truly magical read and had us in fits of giggles as we read. We cannot wait for the third book in the series which is due out in October, The Twitches Meet a Puppy! Hayley grew up in and around Berkshire and after a short stint in magazine publishing, her boss encouraged her to apply for the MA in Creative Writing at UEA where she gained a Distinction. In 2006 she won an Escalator Award from Writers Centre East and a Grant for the Arts to write her first novel, Jar Baby (Dexter Haven, 2012). This was a book that I first saw on Twitter, the buzz pre publication from the author had me intrigued and once I looked up more information on the book I knew it would be the perfect book for my little bookworm for adding to her bookshelves. Meet The Twitches is a delightfully charming tale about a young girl named Stevie who we first encounter in her flat in the city, she is unhappy that her life is being packed up in preparation for a move to the country. The arrival of her favourite grandmother, Nanny Blue, brings much happiness as well as a very interesting box for Stevie. The box contains the most wonderful surprise, a teacup house, complete with little garden, wee front door and lots of rooms for the inhabitants of the teacup house. Only there are no dolls in this house, instead there is the Twitch family. A family of four little bunnies, Gabriel, Bo, Fig and Silver who come to life whenever Stevie isn’t looking. The Twitch family are inventive, exciting and utterly wonderful characters. Beautifully bright and crisp artwork bring the tale alive, providing some fantastic images from the story, especially when it comes to the enterprising inventions of the eldest of the Twitch children. The mishaps and mischief that is occurs makes for a delightful read and coupled with the lovely illustrations this is the perfect book to share with your children. The book is aimed towards readers aged five and over, it would probably be a good stepping stone into books with chapters and little more to read after moving on from picture books. We read a chapter or two at bedtime and were breezing through the book in no time, the temptation to read on once the little one had fallen asleep to see what would happen was almost too much once or twice. We enjoyed this book so much that I preordered the next book in the series as soon as I heard that it was available. A magical and exciting tale that takes readers (young and old) on a journey and reminds them to enjoy the little things around them, like a teacup house or fried egg sweets.